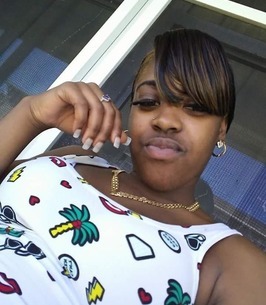 Tikeyah Shaquille Jones, 24, of Pensacola, FL gained her heavenly wings on September 28, 2018. She was born to her loving parents Sjadorhia “Bang” Hand and David Parson on February 24, 1994. She was a smiling loving person, who enjoyed making people laugh, acting silly and dancing. Everyone appreciated Tikeyah’s advice because it was always good. She respected and loved her family and friends. Tikeyah’s favorite dish was macaroni and cheese. She is preceded in death by: grandparents, Katie Bell Nettles, Hortense Parson, Hubert Parson and John William Hand; step-grandfather, Paul Young; uncle, Joel Hicks and cousin, Antonio White. Tikeyah leaves to cherish her memories: mother, Sjadoria Hand; father, David Parson; siblings, Danny, Keyonia, Trinity, Jessica, Chelsea, Devin, Evin, Pumpkin, Jermaine, Lil David, Gerald and Louise; grandmothers, Willametta Nettles and Yolondè Jackson; great-grandfather, Howard Nettles, Sr.; aunts, Katina Nettles, LaKresha Jackson, Constance Johnson, Jean Fields, Ann Simmons, Pam Dukes, Sharon Hicks, Traci Hicks and Felecia Hicks; special aunt, Michelle Hicks; uncles, Michael Wingate, Leroy Lymon, Jonas Hand and Howard Nettles; special uncle, Michael Hicks; special nephews, Danny and Jarvis; cousins, Anthony Nettles and Keashia Campbell; special friends, Toccarra and Nephoteria; very special friend, J Leno, close friend, Tashana, Bri, and Dominique and a host of relatives and friends. Visitation will be from 9:30 a.m. until funeral service begins at 10:30 a.m., Saturday, October 6, 2018 at Pentecostal Temple, 6550 North Palafox Street, Pensacola.